Missing heritability. The concept of missing heritability is often invoked to demonstrate that existing genetic techniques only identify a fraction of the overall genetic risk for human diseases including the epilepsies. This statement implicitly assumes that we have a good and solid understanding of what the magnitude of genetic risk actually is. However, when looking at the epidemiological studies that have investigated familial risk of epilepsy, some of these studies have inherent problems, including small sample sizes, different phenotype definitions, recruitment bias, and lack of controls. A recent study in Brain now reassesses the familial risk of epilepsy in a population-based cohort of the Rochester Epidemiology Project. There are few instant classics in the field of epilepsy genetics – this study is one of them. Familial risk. Genes aside – what do we know about the genetic risk of the epilepsies? What are the numbers that can be used for counseling patients with respect to sibling and offspring risk? We know that there is an increased risk of epilepsy in relatives of patients with various epilepsies, but where does this data come from? And how good is it? Enough questions asked – here is the answer in a nutshell. The evidence for a genetic burden for the epilepsies comes from two major sources: twin studies and epidemiological studies. Twin studies give a dramatic account of the overall genetic burden for epilepsy. However, they tell us little about the risk to non-twin relatives. This is only something that epidemiological studies can do. And this is where the problem starts. Epidemiological studies. There are many epidemiological studies of the genetic risk of epilepsies, but only few of these studies can be used to reliably assess risk to relatives. Epidemiological studies are prone to various biases and are only reliable if the sample is large enough to provide good estimates. In addition, in epilepsy, the precise phenotype is crucial. There are several large population-based studies of the familial risk of epilepsy from Scandinavian hospital record-linkage studies. However, the phenotypic information in these studies is limited and often not precise enough to be applicable to a particular type of epilepsy. Peljto and collaborators now present a population-based epidemiological study that applies modern phenotypic criteria without introducing many of the biases that haunt epidemiological studies. GESDR. The Genetic Epidemiology of Seizure Disorders in the Rochester study (GESDR) takes advantage of a long-term epidemiological study in Rochester, Minnesota. 660 residents of Rochester were diagnosed with epilepsy between 1935 and 1994 and their medical records were reviewed. Of their 2439 first-degree relatives, 75 were diagnosed with epilepsy. This is a 3.3-fold increase over the population risk observed in the same study (A brief disclaimer: The proper epidemiological term for this is Standardized Incidence Ratio SIR, but I will refer to this as a 3.3-fold increase for the sake of simplicity). This increase was dependent on the epilepsy type of the proband, with the highest risk present in patients with generalized epilepsies (6-fold risk), particularly for Idiopathic/Genetic Generalized Epilepsies. If the proband had focal epilepsy, the risk of epilepsy in relatives was also increased, albeit to a lower extent (2-fold risk). The epileptic diathesis. Is there a “global” genetic risk to epilepsies that would predispose individuals to any kind of epilepsy? The current study does not find a significant increase risk of focal epilepsy if the proband had generalized epilepsy and vice versa. This is in contrast to previous, earlier data from the same epidemiological project and provides us with a good idea that most of the genetic risk of epilepsy is specific for particular types of epilepsies, not for epilepsy in general. For example, the increase in risk for generalized epilepsy in relatives of a proband with generalized epilepsy is almost 10-fold, reflecting the familial aggregation in IGE/GGE that is seen in many previous studies. Again, while molecular genetic studies address particular genes that are only found in a subset of probands, this is based on epidemiological data that is relevant to epilepsy in general. The maternal effect. The current study also identifies a peculiar phenomenon that has also been found in previous studies. The risk to the offspring of affected mothers is higher than the risk to the offspring of affected fathers. The same effect is also seen in the current study, but with the following additional twist: the maternal effect is restricted to focal epilepsies, and there is actually a reduced risk to children of affected fathers, rather than an excessive risk to children of affected mothers. The risk to children of affected mothers is not much different from the overall offspring risk, suggesting that there is something going on with the risk to the offspring of fathers with epilepsy. There is no good biological explanation for this observation so far. Twin-free heritability. Finally, epidemiological studies of this magnitude can be used to calculate heritability. Even though heritability is a difficult-to-interpret measurement of the genetic impact, it helps put the findings of this study in context with twin studies. In the current study, the authors identify a heritability of 66% for IGE/GGE. This is lower than in earlier twin studies. Nevertheless, this is compatible with the range of possible values obtained in these studies. The value of 66% suggests that there are non-genetic factors at play in IGE/GGE, even though none of these factors has been identified so far. Peljto and collaborators discuss the question whether the term “Genetic” Generalized Epilepsies should still be used given these findings. Big picture. 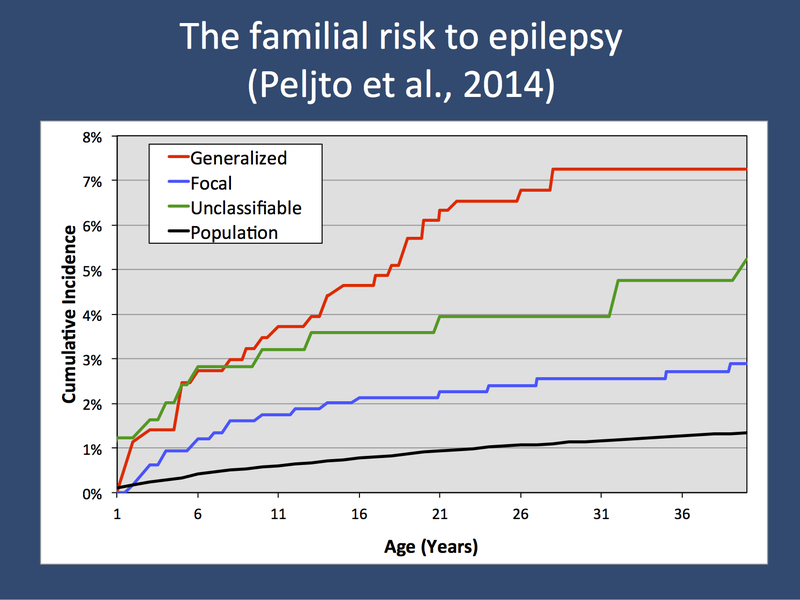 In summary, the current study by Peljto and collaborators is the best and most comprehensive study on familial risk of epilepsy to date. The authors use modern phenotype definitions that help us translate their risk measurements to clinical practice. It is important to realize that even though we are in the age of exome and genome studies, this data will eventually only make sense if combined with sound epidemiological studies. This entry was posted in 2014, IGE/GGE, Papers and tagged epidemiological study, epileptic encephalopathies, familial risk, genetic epidemiology, GGE, heritability, idiopathic versus genetic, IGE, maternal effect, offspring risk, Olmsted County, Rochester Epidemiology Project, standardized incidence ratio, twin study. Bookmark the permalink.